2011 was a special year for City of Sturgis Mayor Mark Carstensen. It was his first year as Mayor and first time leading the acclaimed Sturgis Mayor’s Ride. His first ride as Mayor was especially memorable, however, because it was the first year he had his motorcycle license. 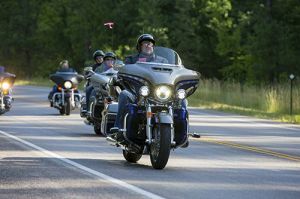 As if it couldn’t get any better, South Dakota Governor Dennis Daugaard attended the ride. Like Mayor Carstensen, Govenor Daugaard was in his first year of office and had just recently received his motorcycle license. Together they rode as new leaders and new riders, leading the way out of the City of Riders and through the celebrated beauty of the Black Hills. Q: The Mayor’s Ride essentially takes folks to the same iconic places every year -- why do people return year after year to ride it again? A: There are so many things to love about this ride. People say they appreciate giving to charity. They also love that it’s “feet up” – we get to ride out of Sturgis, and then continue on to see the unparalleled, breathtaking beauty of the Black Hills, never having to stop. Q: Describe the feeling of riding with a group this large in a place this beautiful – what’s it like? It’s a special feeling. You’re with so many other people, who are like-minded, that share a passion for motorcycles, riding, nature, the outdoors. And we stay together on one of the most remarkable rides in the country. It’s an incredible experience. Q: How many people can participate in the Mayor’s Ride? A: Registration is limited to 200 motorcycles, and we certainly have had full rides in the past. Riding with 200 other bikes (and up to 400-500 people, which include passengers, press and others in vehicles) stopping at Mt. Rushmore for our traditional group photo, and then ending in Custer State Park for a really fun lunch – it’s a ride to remember. Q: What kind of resources and coordination does it take to organize a “feet-up” ride? A: It takes a lot – law enforcement, logistics, organization, perfect timing. We block off the roads at specific times, and all other riders and drivers are required to wait. And we come rolling through. It’s a powerful experience and one we work really hard to make safe, enjoyable and memorable for everyone. Q: There’s a fairly large international contingent of riders who participate in the Mayor’s Ride every year. Why is this so special to them? A: Yes, the international visitors come in a big group and are so excited. The excitement is just bubbling out of them – they are so thrilled to have come all this way, to be a part of this beautiful ride in South Dakota, and experience the camaraderie and community. It’s a cherished event for our international friends. A: Proceeds from the ride have always gone back to our emergency services, supporting the men and women who dedicate so much to rally week – providing aid and keeping us safe. Q: How and when should people register for the Mayor’s Ride? A: Folks can register on-line. Since there are only 200 motorcycle spots available, we really do encourage people to register as soon as possible to be guaranteed a spot. 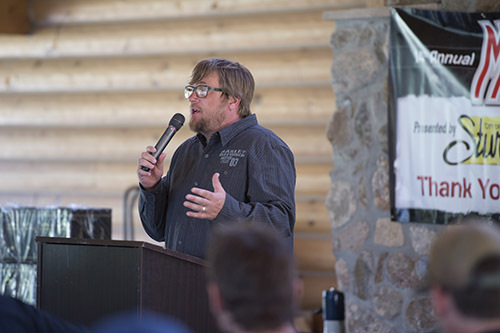 Q: How do Jack Daniels® and other sponsors help make the ride a success? A: The importance of our relationships with our sponsors cannot be overstated – they make this event possible. Without them, the ride wouldn’t be what it is. In turn, we work hard to provide them good value and exposure for their brands and missions. Many of sponsors we’ve had their support for many years, and some are brand new. It’s all about supporting each other and investing in relationships. And the benefit to riders is huge: everyone rides away with incredible swag that our sponsors have generously contributed. Q: If someone hasn’t participated in the Mayor’s Ride yet but is thinking about it, what would you tell them? * Stacy rides a 2106 Heritage Softail Classic and is a writer for the Sturgis® Motorcycle Rally™.